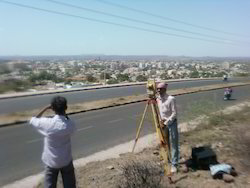 We are providing Total Station Survey Service to our client. We are providing a quality proven range of Total Station Survey Service to our prestigious clients. This is an electronic/optical instrument used in modern surveying. The total station is an electronic theodolite which is integrated with an electronic distance meter (EDM) to read slope distances from the instrument to a particular point. Apart from this, offered services are also available as per the need of our customers.